We are specialist metal fabricators who can manufacture a huge variety of different products using mild steel, stainless steel and aluminium to suit your needs. We are able to produce bespoke, unusual and one off fabrications both at our Cullompton workshop and on your site. 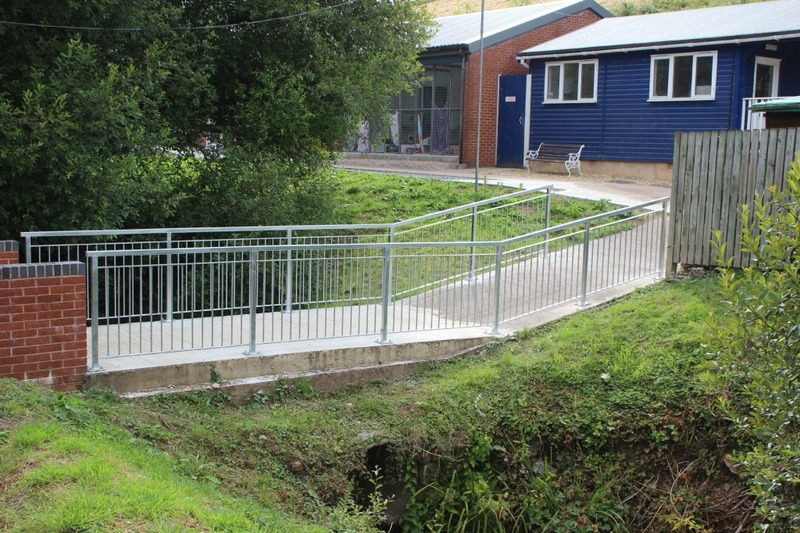 We fabricated these walkway safety handrail from mild steel, they have a galvanised steel, they are designed to prevent anyone from falling into the stream, we installed them for the RSPCA in Exeter. We work locally around the Mid Devon, North Devon, East Devon, West Devon, Torridge & South Hams areas as well as working throughout the south west covering Dorset, Somerset and Cornwall. We are within twenty minutes drive of Exeter City and about an hour from Plymouth. We are also close to Wellington, Taunton and Bridgwater. If you are looking for someone to supply and manufacture excellent quality gates, railings, metal staircases, balustrades, staircases, fire escapes, structural steel, one off creations plus a whole lot more, then look no further. Manufacturing products using a range of different materials to achieve the look and finish that is requested, we can provide a full installation service to get your project finished promptly. 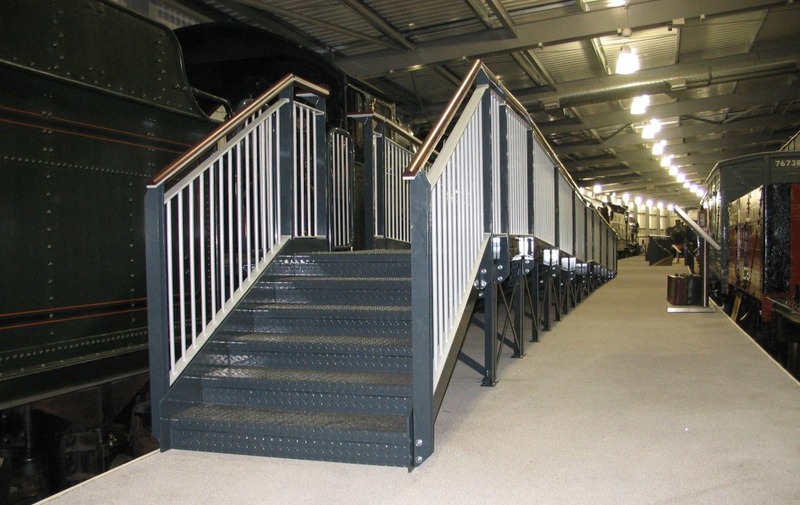 The disabled access ramp to the Collett Mogul Locomotive and Tender at The Engine House Severn Valley Railway Visitor Centre near Highley, Bridgenorth is the only under cover facility of its kind in the country. We manufactured it in Devon, it was transported and installed at the same time as the locomotive collection was being moved in. 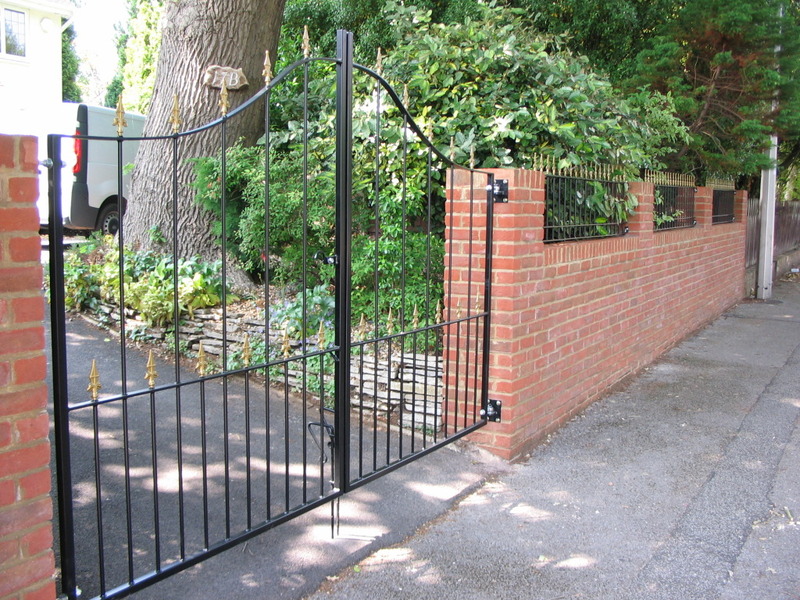 You might be planning to make some improvements to your property, maybe we can make you a small garden gate, or a more impressive pair of arched gates to enhance the entrance to your drive. If your old fence is looking a bit tatty, why not replace it with a decorative railing which can be tailor made to your own design, it will enhance the appearance and the security of your property. If you are planning to have a new balcony we can provide the metal frame work and the balustrade to suit your requirements. Also we can make repairs and refurbish corroded products, we can completely restore and repair most metalwork and give it a new lease of life. 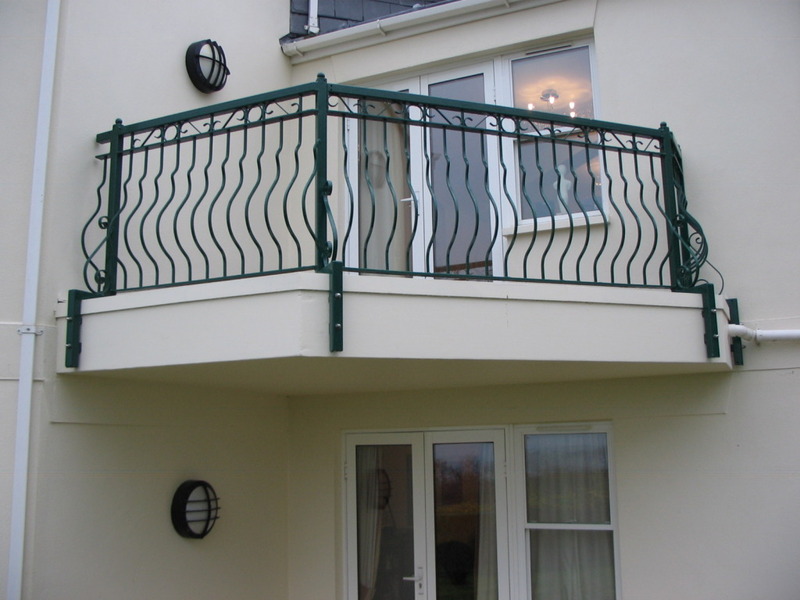 This stylish balcony in Saltash, Cornwall, was in a badly corroded state, we removed it, replaced and restored some areas, made good all the necessary repairs, it was then stripped, galvanised, powder coated and re installed along with a number of others on the same building that were in a similar state. We can also help you with building an extension or a loft conversion as we can manufacture and install any metal work requirements you have. We also have facilities to cope with sheet metalwork, batch work and larger fabrications such as sliding gates, industrial fire escapes and structural steel. 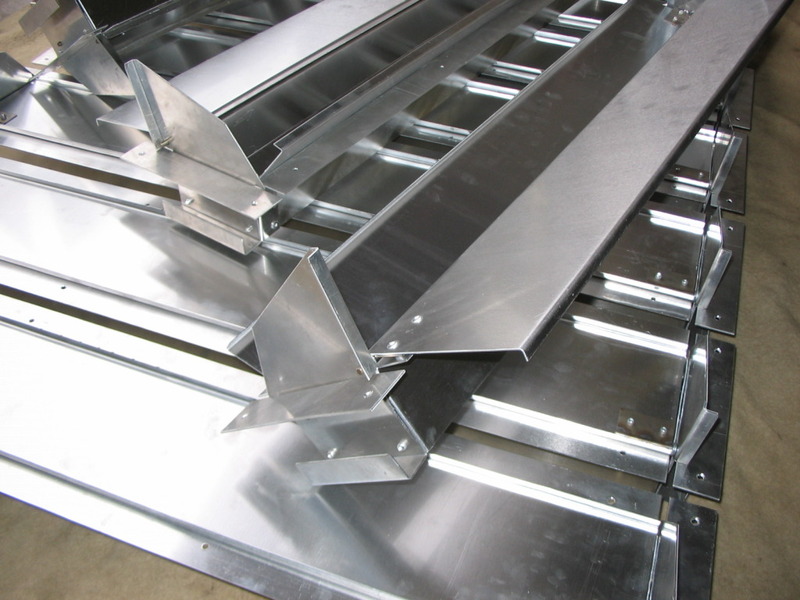 These chicken house ventilation ducts were fabricated from sheet aluminium, the stainless steel hinges were use to prevent corrosion, they have two adjustable flaps to control the air flow. In the last few years we have been pleased to be of service to customers from a wide range of industries such as building & construction, trampoline equipment, wheelchairs for disabled, heritage interpretation & tourist development, local councils, cricket & football clubs, pubs & hotels, communication, architectural building restoration, machinery, plant equipment, dry cleaning, transport, warehousing, agriculture, farming, storage and security. All staff have CSCS and PASMA cards and are used to working on busy sites. Risk assessments are carried out and Method statements are written and all paperwork is issued prior to any work taking place on site. Please call Derek on 01884 33915 for further details. Or to contact by email click here. Motorhome bumper towbar, mobility scooter carrier, motor scooter rack and modified trailer.